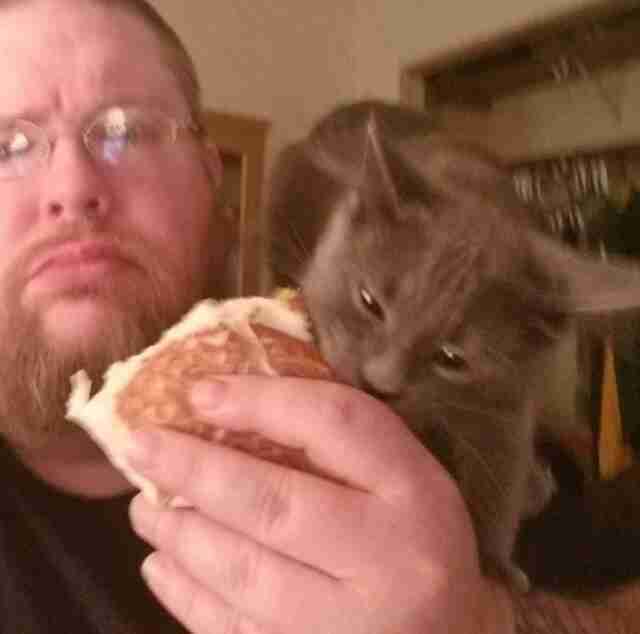 “As a tiny kitten, he would actually climb us ... We've never had a cat this obsessed with human food before." Negan the 7-month-old rescue cat loves to cuddle, is always purring and is happiest when he’s being held by his mom or dad — except when there’s food around. 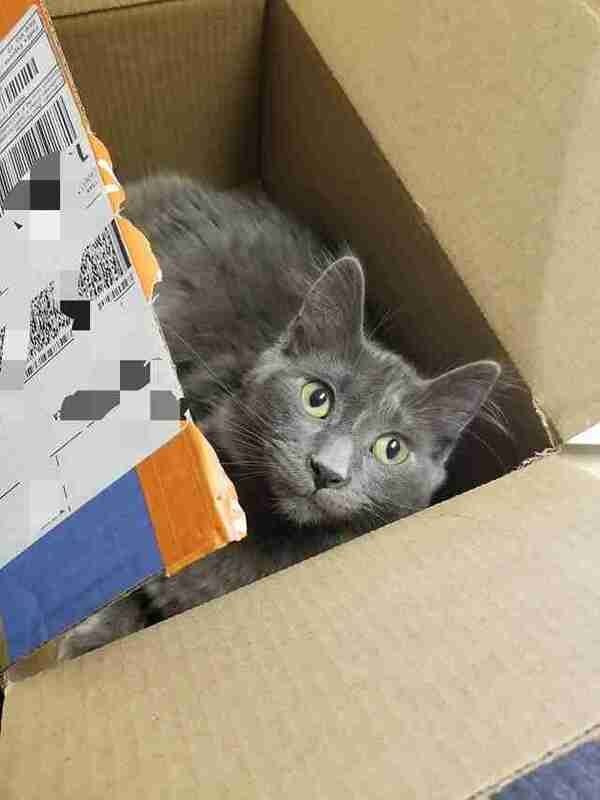 Negan’s owners, Don and Tischauna Hinrichs of Minnetonka, Minnesota, noticed within the first week of adopting him that there was something strange about their new kitten: He would stop at nothing to steal whatever food they were eating. “As a tiny kitten, he would actually climb us to get to the food,” Don told The Dodo. 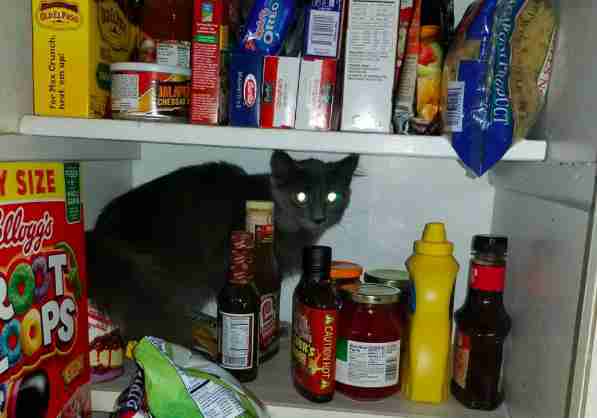 “We've never had a cat this obsessed with human food before." The Hinrichses have never heard of behavior like this — with their own pets, it’s usually been their dogs who were begging for table scraps. “We finally decided to film him in action to show our friends just how crazy he was for people food, and then, like things do, it went viral,” Don said. In a video Don posted on Facebook, Negan is shown lurking around as his dad unwraps a sandwich. As soon as the wrapper starts to crinkle, the cat dodges left, then right, and goes in for the kill with a swift bite — then runs off like the wind. Since the video was posted, it has racked up 19 million views and has brought tens of thousands of fans to a Facebook fan page Don created for Negan. Amid the people tagging friends in the funny video, some viewers voiced concern that the cat wasn’t being fed enough or needed to be trained. But Don said that they typically don’t let him steal bites and that the food-loving kitty is very well cared for. The Hinrichses are doing what they can to curb Negan’s passion — they’ve been training him to stay down, and started keeping a spray bottle around when they’re eating. But sometimes the little guy is just too determined. “He tried to run off with a loaf of bread this morning,” Don wrote on Facebook a few days ago. Don plans to continue posting photos and videos of Negan and his animal siblings. And maybe, with time, he might even become the next resident internet cat. To follow more of Negan’s fun-loving antics, you can like his page on Facebook.